Poached fish is far too underrated, in my opinion. I know it's not necessarily the fanciest, most complicated, or the prettiest way to cook fish. The thing is, when it's done right, it's amazing. Perfectly poached fish is tender and almost melts on your tongue. Because you're not smothering it in sauce, the delicate flavor of the fish really shines. It's a beautiful thing. The problem is that when most people poach fish they boil it until it turns tough and rubbery. Sound familiar? It doesn't have to be that way. I've poached fish many times and every I use this fail-proof technique. Cook it this way and I promise you will fall in love with poached fish. The trick to perfectly poached fish is to cook it gently and over low heat. Don't bring your pot to a boil, or even a simmer for that matter. Lower the heat. 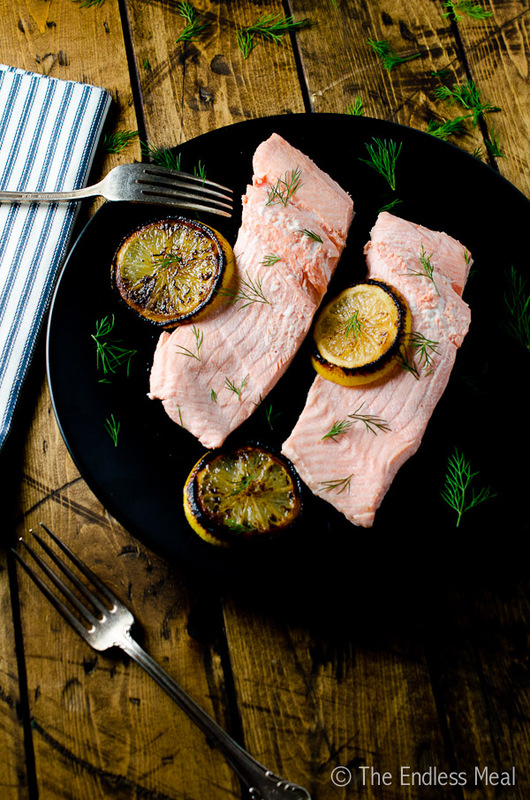 Fish is perfectly cooked when it reaches an internal temperature of 140 degrees. If you don't already own one, I highly recommend picking up an instant-read thermometer next time you're at a kitchen store. If you're cooking fish in the oven or on the stovetop, you can use it to make sure you're not overcooking it. When you're poaching fish, you want the temperature of the water to remain at 140 degrees Fahrenheit. If you are familiar with sous vide cooking then this concept will ring a bell. Basically, if the water temperature never rises above (or much above) 140 degrees, then the fish will never overcook. Even if you leave the fish in the pan a little longer than necessary, the fish will remain perfectly cooked. So how do you tell if the water is the perfect temperature? An instant-read thermometer is your best bet here. Simply hold the end in the water until you get a reading then adjust your stove's element until the water stays at 140 degrees. And if you don't have an instant-read thermometer? The water in the pot will start moving around, and you'll see steam rising from the pot. You might notice 2 or 3 small bubbles rising, but no more than that. If the water is simmering, it is too hot. How long do you cook the fish? That depends on the size of the piece of fish you're cooking. The fish you see in the photos took 10 minutes, but if your fish is thicker, it will take longer. 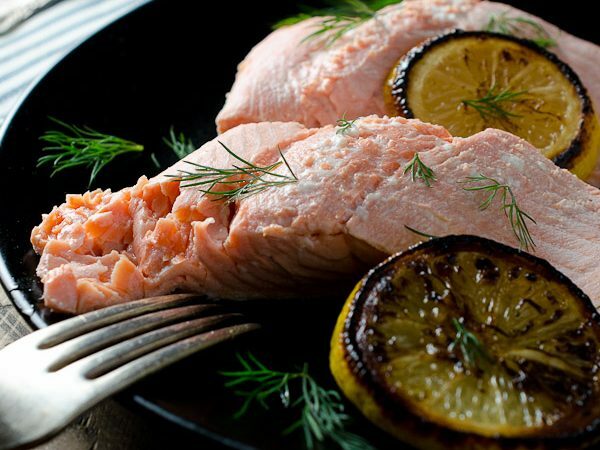 Remember that it won't overcook if the water temperature stays at 140 degrees, so this is one time you can err on the side of caution and not worry about overcooking your fish. What kinds of fish are best for poaching? I prefer meatier fish like salmon or steelhead trout. Halibut and arctic char are great poached, too. I tend to steer away from poaching thin fish, like snapper or tilapia, as I find they're too delicate and can fall apart. That's only a personal preference though and not a hard and fast rule. Try topping your perfectly poached fish with a squeeze of charred lemon juice, some fresh dill or a little lemony hollandaise. Perfectly poached fish should unbelievably tender and melt in your mouth. With this easy technique, you can make sure that every time you poach fish it turns out perfect. Put all the ingredients, except the fish, in a large skillet with high sides and add at least 2 inches of water. Heat the water over medium heat until it reaches 140 degrees Fahrenheit, or until it is steaming, the water is moving around but not bubbling at all. You should be able to dip your finger into the water very briefly without burning it. (Be careful if you do this, though. I don't want you to hurt yourself!) Reduce the heat to medium-low. Once the water is at 140 degrees, slide the fish into the pot. If there is not enough water to cover the fish, add a little more. The trick here is that you want the water to remain at a fairly constant 140 degrees so that the fish doesn't overcook. The fish is ready once it reaches an internal temperature of 140 degrees. Without a thermometer you can test for doneness by seeing if the flesh flakes easily from the fish. 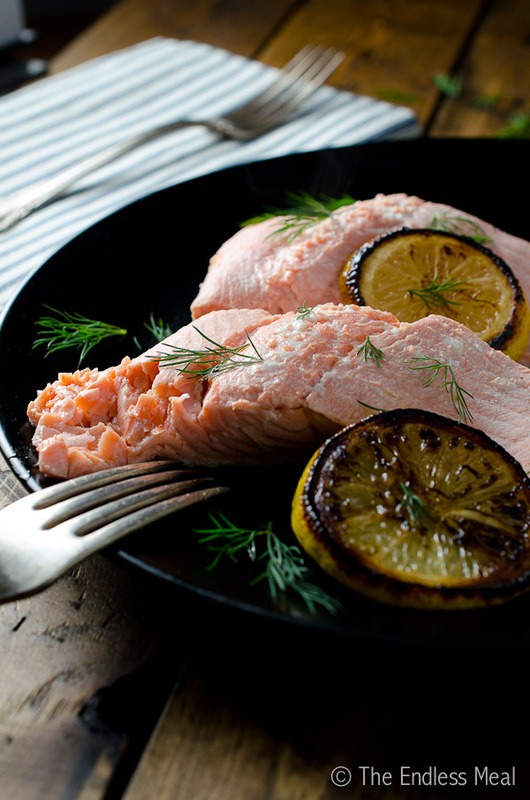 A salmon fillet will take approximately 10 minutes to poach. The poaching time will vary depending on the thickness of the fish. Remember though that as long as the water does not rise above 140 degrees you will not overcook your fish. Carefully remove the fish from the poaching liquid using a slotted spatula and serve it immediately. 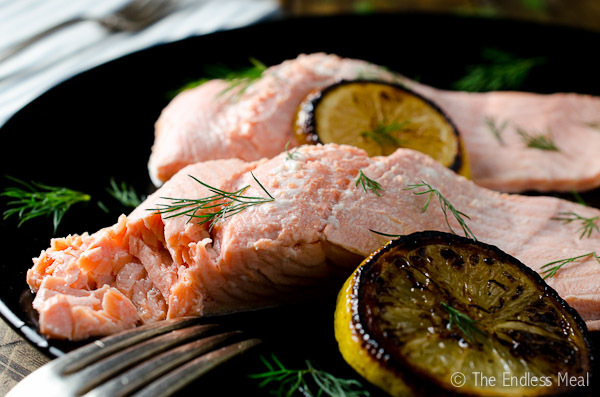 Thicker, meatier fish such as salmon, trout, halibut and arctic char are best for poaching. I love eating poached fish – but rarely make it. You definitely have motivated here to poach fish tonight for dinner.. this looks so delicious. Totally agree it is underrated! I glam it up by poaching in coconut, sometimes spiked with plenty of flavour! I adore poaching. It is SO JUICY! Coconut is the best, right?!! I made something similar to this the other day (only with chicken, not fish) and used coconut milk, lime, lemongrass and a few other tasty things. Yum! This looks really yummy. Butter poaching lobster and fish in a beurre monte is also something very special. We cooked lobster on NYE this way and then had cod the next day and it was a fabulous way to prepare it. Check out Thomas Keller’s beurre monte (emulsified butter) sauce recipe. Basically, you boil a few tablespoons of water and whisk in butter. It ends up looking more like cream than butter, and is so amazing!